Historic Gadsden Don't Tread on Me Snake flag. This nylon flag is digitally dyed for excellent outdoor performance and durability. The flag comes with the standard canvas header and brass grommets and feature four rows of lock stitching on the fly end. 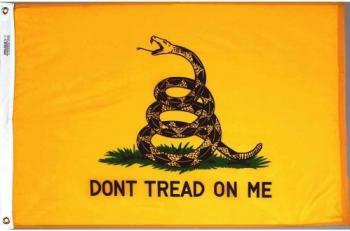 Try aGadsden Don't Tread on Me flag from All Star Flags.